Andrew Nierenberg, MD, Liz Dauten and Kent Dauten have joined forces to advance treatment for bipolar disorder. The Dauten Family Center for Bipolar Treatment Innovation at Mass General seeks to advance treatment by creating a global epicenter for research, education and outreach. Researchers from the world-renowned Department of Psychiatry at Massachusetts General Hospital have launched a center to advance the treatment of bipolar disorder thanks to an endowment from a family affected by the disease. The mission is to create a global epicenter of research, coordinating studies and mining for innovative ideas. The mission of the new Dauten Family Center for Bipolar Treatment Innovation includes research, global collaboration and education with the goal of revolutionizing the understanding of a disease that disrupts the lives of an estimated 2 to 4 percent of the adult population in the United States. 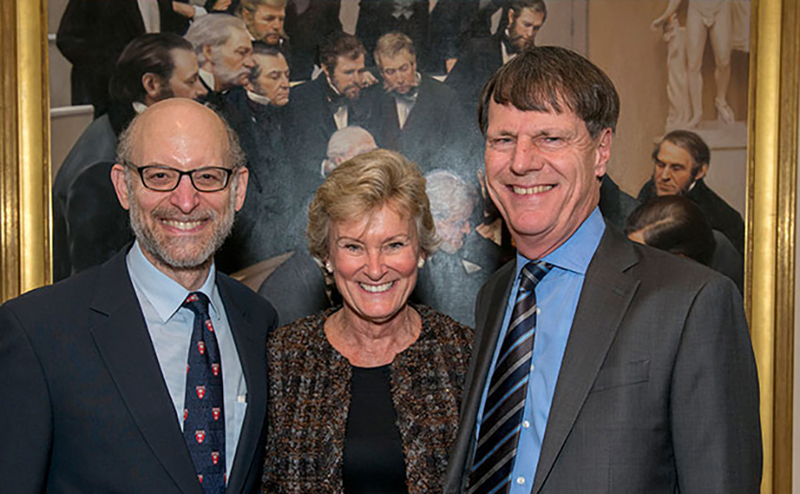 Kent and Elizabeth Dauten, of the Chicago area, have kick-started the new center with a gift inspired by the compassionate treatment of their own children at Mass General and the forward-thinking research of Andrew Nierenberg, MD, the center’s director. “We are working to find innovative treatments among the broad range of options. It’s not just limited to medications, it’s anything that really helps people,” says Dr. Nierenberg, who is among the most widely cited international experts on bipolar disorder. Bipolar disorder, formerly known as manic depression, is a mood disorder that results in episodes of mania to depression. It is a lifelong condition that often recurs, even with treatment. Despite recent progress identifying genes that contribute to the development of bipolar disorder, the biological underpinnings are not well understood. Research funding is sparse even though the disease costs patients, families and society an estimated $210 billion a year. Dr. Nierenberg seeks to raise $50 million to attain a long-term endowment for the Dauten Center. “Bipolar disorder costs a lot in terms of personal suffering and the monetary cost is staggering. Even though it’s so prevalent, it is grossly understudied,” Dr. Nierenberg says. The last time a drug was developed specifically to treat bipolar disorder was 70 years ago, when lithium was introduced. Lithium has a variety of side effects that drive the urgency to find new treatments. The last time a drug was developed specifically to treat bipolar disorder was 70 years ago. That’s why Dauten Family Center researchers are casting a wide net. They are collaborating with researchers around the globe to create an epicenter of research, coordinating studies and mining for innovative ideas. Mass General’s Department of Psychiatry has long been recognized as a national leader in psychiatric care and research. It has earned the #1 ranking in Psychiatry in U.S. News & World Report for 19 of the past 23 years. The department recently joined forces with the Mass General departments of Neurosurgery and Neurology in a new hospital-wide initiative intended to advance brain science, deepen the understanding of diseases of the mind and develop more effective treatments. Dauten Family Center researchers plan to work with laboratory scientists at Mass General, testing a variety of drugs against brain cells (neurons) of people with bipolar disorder grown in laboratory conditions. Dr. Nierenberg points to promising evidence that bipolar disorder is a disorder of brain energy metabolism — the process by which cells convert nutrients into energy. Because patients with bipolar disorder often swing from periods of very high brain energy (mania) to periods of low energy (depression), a study will use imaging technology to look for abnormalities of brain metabolism in people with bipolar disorder. The goal is to identify targets for new drug therapies. Dauten Center researchers are also studying lifestyle factors such as diet, exercise and mindfulness as possible treatments. The center also hosts young research fellows and visiting professors from around the world, as part of its mission to educate the next generation of researchers. Ordinarily circumspect about their diverse philanthropic interests, the Dautens decided to give their name to the center to help fight the stigma of mental illness that often prevents people from seeking treatment and inhibits funding. To learn more about Mass General research on bipolar disorder or to make a donation, please contact us. Donate to the Dauten Family Center for Bipolar Treatment Innovation.